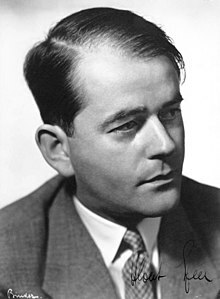 Berthold Konrad Hermann Albert Speer (German: [ˈʃpeːɐ̯] ( listen); Mairch 19, 1905 – September 1, 1981) wis a German airchitect wha wis, for maist o Warld War II, Reich Meenister o Airmaments an War Production for Nazi Germany. Speer wis Adolf Hitler's chief airchitect afore assumin meenisterial office. As "the Nazi wha said sairy",[lower-alpha 2] he acceptit moral responsibility at the Nuremberg trials an in his memoirs for complicity in crimes o the Nazi regime, while inseestin he haed been ignorant o the Holocaust. ↑ Awtho dismissed bi Hitler, Speer wis immediately re-appyntit in the Flensburg Govrenment as Meenister o Economics. ↑ The teetle o a BBC2 documentary, The Nazi Who Said Sorry. This page wis last eeditit on 9 Apryle 2017, at 01:27.